Daniel Oliver is Chairman of the Board of Education and Research Institute and Senior Director of White House Writers Group in Washington, DC. Donald Trump, the Republican Party’s nominee for President? Argh! It is difficult to argue with that sentiment. Still, Argh! is not a political program suitable for a self-governing people. We might ask, “What would William F. Buckley Jr. recommend?” As it happens, Buckley addressed precisely this question. The argument by relative merit is wonderfully persuasive. In some cases, it is, I think, conclusive. If one master will enslave me ninety days a year, a second only eighty-nine, if I may choose between them and must choose one, I shall unhesitatingly, all else being equal, elect to serve under the latter, and I should find no difficulty whatever defending my choice. My reasoning becomes inadequate, and perilously so, only when, in my zeal to stress the relative merit of the less exacting master, I find myself speaking approvingly, even enthusiastically about him. When that happens, there is danger to mind and morals. The danger to the Republican Party of today lies bare breasted in its universal emblem, I like Ike. It should read, I prefer Ike. The danger in supporting Trump is that the necessary attendant activities might slide over from opposition to Hillary Clinton ― born to lie, born to cheat -- into enthusiastic approval of her opponent. The program and goals of the Democratic Party are to enlarge the already extended interference by the state into the lives and freedom of the people, extracting, always, more of the fruits of their labor. The purpose (assuming it still has one) of the Republican Party, founded to promote freedom, is not just to resist the continued collectivizing efforts of the Democrats, but actually ― yes, actually ― to roll back the state, to extend freedom. Conservatives should note that supporting Donald Trump is less apparently dangerous to the integrity of the Republican Party (which he has crashed), and therefore to the Republic, than was supporting Bob Dole, John McCain, or Mitt Romney, who were enthusiastically welcomed by the establishment Republicans, but none of whom would have made any serious attempt to roll back the intrusions of the progressive state, accepted by President Eisenhower but nurtured, effectively and disappointingly, by President Nixon, as well as by legions of progressive Republican office holders in the subsequent decades. In 1972, many conservatives decided to withhold their support from the numbingly big-government, bureaucracy-building, wage-and-price-controlling President Nixon ― until the Democrats nominated George McGovern, who, conservatives decided, was just … too … dangerous to let become president. A reasonable Republican today, dissatisfied with Donald Trump, could come to the same conclusion about Hillary Clinton: born to lie, cheat, and steal ― and, born to collectivize, and therefore born to enslave. Donald Trump is no conservative, but neither is he more dangerous to the mission of the Republican Party than legions of progressive Republicans have been. And supporting Trump will at least tend to help other Republican candidates get elected. And nota bene: if Trump wins and turns out to be a serious danger to the Republic, the Republicans can call for his impeachment ― finally, a constitutional project a Liberal could love ― a project made all the easier by Trump’s selection of Gov. Mike Pence as his running mate. 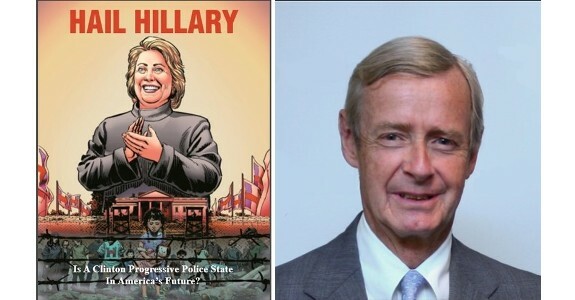 Mega-crony capitalist/socialist Barack Obama and his would-be successor Hillary Clinton are the two people on the planet most destructive of traditional American values. Read Holman Jenkins in the Wall Street Journal, here, for a quick review of how awful for America President Obama has been. And then remember: Hillary will be worse. Daniel Oliver is Chairman of the Board of Education and Research Institute and Senior Director of White House Writers Group in Washington, DC. In addition to serving as Chairman of the Federal Trade Commission under President Ronald Reagan, he was Executive Editor and subsequently Chairman of the Board of National Review. Submitted by vsteele on Fri, 10/21/2016 - 10:32.
out dated document that has no purpose which is wrong our Founding Fathers created the Constitution which is a vital tool and written document that our written laws are based upon and is the cornerstone of our democracy which also limits government power and prevents government from trampling on our rights and freedoms as Americans. Hillary and Obama big government money machine will continue to send America down the wrong path if she's elected President which she will not. Besides America will not elect Hillary Clinton as President because of her corrupt and dishonest record she will lose the election to Donald Trump because he's the one who has leadership an outsider who will also rein in on the DC establishment, special interest groups and bureaucrats. Donald Trump is for real change and he will be the President for all contrast to Hillary Clinton who will be a President for the chosen few. Submitted by email_registrat... on Tue, 10/18/2016 - 12:27.
with us and the only impeachment deserters would be a few kookoo Republicans. Brilliant idea, but how do we get him elected?